Click Here for Pre-Registration if you are making a financial donation. Check in 7am at Kihei Canoe Club. For several years now, we have gathered on Thanksgiving morning to celebrate the aloha in our paddling community. We donate what we can, bring food for Maui’s hungry families, and burn off some calories before putting them back in later that day. This tradition has been held together by big hearts throughout the years, including Team Primo and volunteers from the former Maui Canoe & Kayak Club. 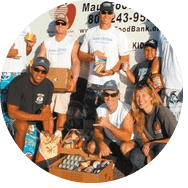 In 2017, Hawaiian Paddle Sports raised more than $10,000 and 1,000 pounds of food for Maui Food Bank, enough to provide 42,000 meals for needy families in Maui County. We are hoping to raise even more this year! Will you join us? This is a for fun, anything that floats, jungle rules… “race.” We will not record times so look around and see where you finish for bragging rights. There are usually a lot of little races within the overall race. Everyone is a winner and door prize tickets will be given to everyone who registers, so stick around after the race for your chance to walk away with some from our sponsors. This event is FREE and open to the public. Registration starts at 7 am. Participants are encouraged to bring a non-perishable food item and/or donation for Maui Food Bank, sliding scale based on your ability. Make checks payable to: Maui Food Bank or donate online. If you are making a financial donation, please preregister online so we can plan for your t-shirt size. For a good cause and good times, we hope to see you at the Maui Paddle For Hunger on Thanksgiving Day 2018! Thanksgiving Day, Thursday, November 22, 2018. Check in: 7am. Please park in the large grass lot across the street. Do not park in ABC parking lot, Kihei Canoe Club or the Kihei Canoe Club Pier. Use the Pier for active loading/unloading of vessels. 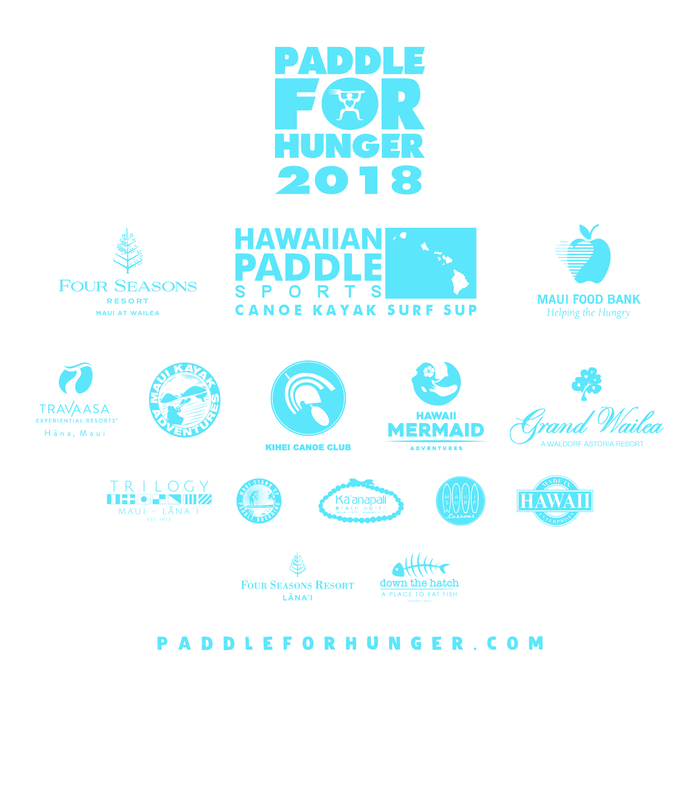 Checks payable to Maui Food Bank (Put “Paddle For Hunger” in Note Section) or use the Registration form on this page to donate now directly to Maui Food Bank. Canned Meat and Tuna, Canned Fruits and Vegetables, Canned Meal and Soups with Protein, Cereal, Rice, Pasta. Drop items in back of designated trucks in front of Kihei Canoe Club. Every participant will be given a ticket at registration. Prize give aways will begin immediately after the race finish. Must be present to win!!! Race Course: Kihei Canoe Club to Turn Buoy at Kealia Pond River Mouth/Pavilion and back to Kihei Canoe Club Pier. 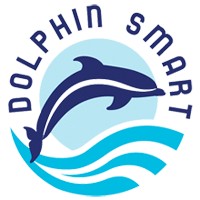 Short Course: Turn early…. anywhere, no shame. Vessels: Participants need to provide their own vessels, Outrigger Canoes (OC 1-6), V1, Surfski, Stand Up Paddle Board, Prone Paddle Board… or anything else that floats. Safety: Please be respectful of our water safety team. If your vessel is slower please take the ‘short course’ and turn early. It’s Thanksgiving Day and we want everyone to be able to get home to their families. Donate cash or prize (door prizes and/or auction items) valued $300 or more and your company logo will be on the event website and back of the event T-shirt. Large logo for donations $1000+, Medium logo for $500-$999 and Small logo for $300-$499. What we know today as “Paddle for Hunger” was originally an OC1 time trial for Malama Ula Canoe Club (Wailea Canoe Club) in 2000. Over the years, paddlers from other clubs joined in, including OC2’s and OC6’s. In 2002, Al Duarte suggested paddlers bring canned food that could be donated to Maui Food Bank and the Turkey Trot was formed. The event grew exponentially and in 2007, it officially became a fundraiser for Maui Food Bank. Since 2009 the event has brought in more than $10,300 in cash donations. In the years 2012-2014, it brought in 3,062 pounds of food. Over the years, volunteers from Maui Paddling Hui (formerly known as Maui Canoe and Kayak Club) organized the race ensuring it would happen every year. Past organizers include: Peter Konohia, Don and Keri Meihling, Rob Phillips, Sharron and Ricky Balidoy, Tim Lara, and Tyson Kubo. Most years it was a “non-event” group of friends paddling together since there was no permit or insurance.  Since 2012, Hawaiian Paddle Sports has supported Paddle for Hunger as part of its monthly Malama Maui give back program, supporting Maui Food Bank as our chosen December nonprofit. 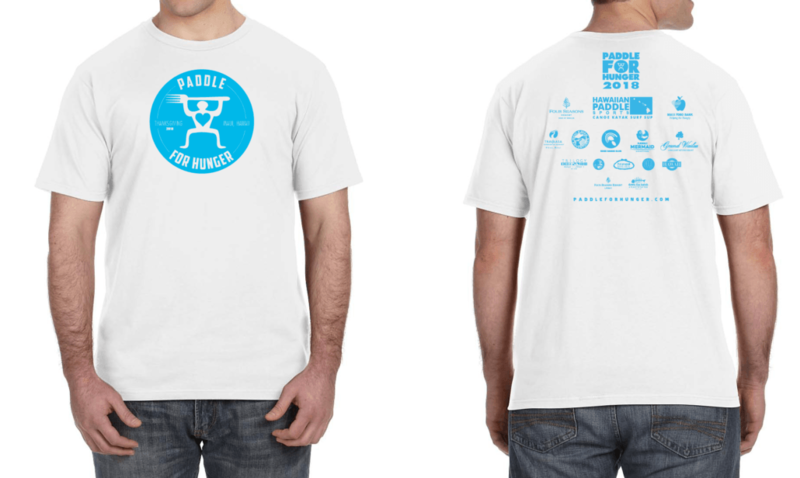 In 2015, Hawaiian Paddle Sports stepped up to organize the event, securing water safety, permits, insurance, silent auction items, and door prizes. 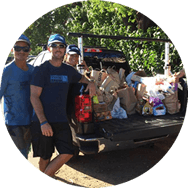 In 2017, with the help of Maui’s generous community and paddling ohana, Hawaiian Paddle Sports raised more than $10,000 and 1,000 pounds of food for Maui Food Bank, enough to provide 42,000 meals for needy families in Maui County. 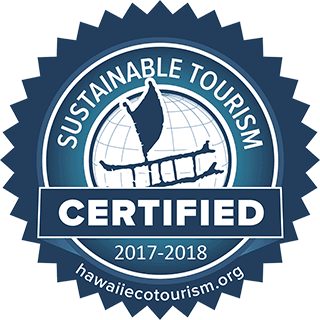 To learn more about Hawaiian Paddle Sports’ mission, values, and community give back program, visit our About Us page.